The British writer L. P. Hartley is perhaps best known for his novel The Go-Between (1953), a beautifully written story of a young boy’s loss of innocence set against the backdrop of a blistering English summer. It is a book of many contrasts; perhaps most notably, the divisions between the classes, the barriers and conventions that can stand in the way of relationships between people from markedly different social backgrounds. 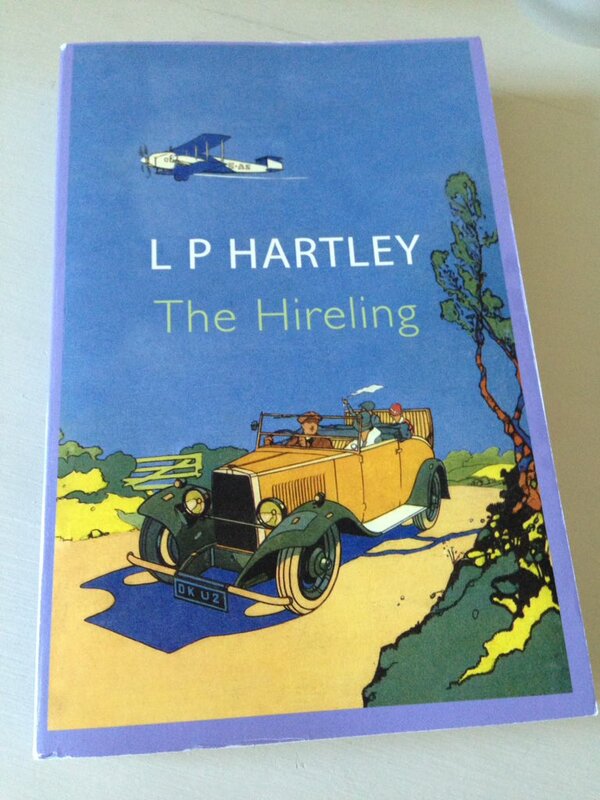 Hartley explores this theme again in The Hireling as an emotionally repressed chauffeur finds himself developing a somewhat inappropriate relationship with one of his regular customers, the lonely but very wealthy Lady Franklin. The novel centres on Leadbitter, a hard-bitten ex-Army man who is struggling somewhat to find his way in civilian life – the story is set in the period following the First Word War. Part of Leadbitter’s problem stems from his inherent tendency towards bitterness and self-protection. His life is governed by a certain moral code, one that values loyalty, punctuality and discipline, while keeping any softer emotions or feelings firmly under wraps. Then one day Leadbitter is called to collect a new customer, a young widow by the name of Lady Franklin, who hires him to take her on a pilgrimage to a country cathedral. As it turns out, Lady Franklin is still grieving the loss of her husband – she blames herself for not telling him she loved him and for not being by his side at the time of his death some two years earlier. Part of her reason for hiring the car is to pour out her troubles to a complete stranger – namely Leadbitter – in the hope that by doing so she can get over her loss and find a way back to reality. Moreover, Lady Franklin has been advised to take more of an interest in other people’s stories in the belief that this will aid her recovery. So, to this end, she asks Leadbitter to tell her about his own life, which he does by inventing an imaginary wife and family – in the heat of the moment, he thinks this might secure him a decent tip. One cathedral trip leads to another, each outing following a familiar pattern, one that begins with Lady Franklin and her ‘obsession’ for unburdening herself and then ends with Leadbitter spinning tall tales of his make-believe home life. In essence, Lady Franklin is living vicariously through Leadbitter and his family, to the extent that she helps him out financially when he fabricates a story about the imminent repossession of his car. Leadbitter, who for years has had no emotional life to speak of, takes a perverse sort of pleasure in inventing an imaginary one for the benefit of his employer. In some ways, he is living out a personal fantasy, one in which Lady Franklin herself comes to play an increasingly important role. Much to his surprise, Leadbitter finds himself getting emotionally attached to Lady Franklin to the point where he makes a pass at her during one of their trips. Moreover, he also comes clean about his fictitious wife and family by declaring that they don’t exist. Perhaps unsurprisingly, Lady Franklin is rather shocked by her driver’s actions, so she rebuffs him and asks to be let out of the car some ten miles from home. While Lady Franklin is very grateful to Leadbitter for the help he has given her in overcoming her grief – his actions have in fact prompted a kind of reawakening in her – she cannot begin to think of him as a potential lover. For a start, they belong to very different social spheres; and besides, as far as Lady Franklin has been concerned – at least up to this point – Leadbitter was a married man with a family to support. How could she possibly get involved with an adulterer or a liar when she is just getting over her own guilt at the loss of her husband? At first, Leadbitter’s pride is severely wounded; as far as he sees it, Lady Franklin has led him up the garden path and then rejected him because of his class. But then his feelings towards her start to soften, especially once he discovers that she has fallen for a clot of an artist named Hughie who also happens to call on his services as a driver. Hughie doesn’t love Lady F; rather he is attracted to her money, the glamorous lifestyle such a bounty can support. In a rather fateful turn of events, Leadbitter discovers that Hughie plans to continue seeing his longstanding lover, Constance, after his fothcoming marriage to Lady Franklin. So, Leadbitter is faced with a dilemma: should he destroy Lady Franklin’s new-found happiness by revealing the true nature of Hughie’s intentions, or should he keep quiet and let the erroneous marriage go ahead? I’ll leave it there with the plot; to reveal any more might spoil the story, although it’s fair to say that what happens next is pretty dramatic. While I didn’t love this book quite as much as The Go-Between, I really did enjoy it a great deal. The central characterisation is excellent, very convincing and compelling. Hartley takes a lot of care and attention in setting up the nature of Leadbitter’s character in the novel’s opening chapters, an investment which proves very valuable as the narrative develops. Deep down, Leadbitter seems to have Lady Franklin’s best interests at heart, even if he struggles to reconcile and contain his conflicting emotions – at a critical point in the story, he almost blurts out his true feelings for her but is cut off before he can finish his declaration. He knows his place in the British class system but longs to break away from it. All in all, this is a very good novel with much to commend it. There’s a film version too, summarised here in this typically insightful piece by The Guardian’s Peter Bradshaw. It sounds somewhat different from the book, especially in the closing stages; nevertheless, I’m looking forward to watching it very soon. This entry was posted in Book Reviews, Hartley L. P. and tagged Book Review, Classics Club, Fiction, John Murray, L. P. Hartley, UK on August 15, 2017 by JacquiWine. Ooh, I think I want this. And not just because of that gorgeous cover! This sounds really interesting Jacqui. I’m slightly obseessed with the generation that returned from the world wars and had to try and fit back in to civilian life, so I’ll definitely hunt this down. I’ve only read The Go-Between by Hartley so I should give his other works a try. Yes, me too. There is something very compelling about these stories of loss and readjustment. I can’t even begin to imagine how difficult it must have been for men like Leadbitter to adjust to civilian life. On a similar theme, have you read In a Lonely Place by Dorothy B. Hughes? If not, I would definitely recommend it. I couldn’t help but be reminded of Dix Steele as I was reading this one. Even though the Hartley isn’t a noir novel, there are some loose parallels between the central characters. I did read it, after reading your review! I thought it was excellent. I’ll bear it mind when reading the Hartley. I do like the sound of The Hireling’s premise. I think I’ll have to search this one out. I also love your use of the word ‘clot’! I think we should try and resurrect it as we seem to have so many of them in charge at the moment. It’s definitely worth it. Even though it doesn’t quite reach the heights of The Go-Between it’s still a very good novel. And, as you say in your comment, the premise is rather appealing. ‘Clot’ just seems like an appropriate word for Hughie as he does come across as a bit of a buffoon – and a fairly insensitive one at that. I get the impression from Peter Bradshaw’s review that the film dials up (and alters) Hughie’s character/role compared to the book. He sounds like a nastier piece of work there, even more self-serving. Apologies for the incomplete response earlier – I pressed ‘reply’ by accident before I had finished typing the reply on my phone! Not to worry! It does seem that the film might also be worth seeing. I trust Peter Bradshaw’s opinion. Yes, I agree on both counts. He’s probably my favourite film reviewer (now that Philip French is no longer with us). Very interesting and sensitive review as always, Jacqui – and I’m so intrigued about the outcome I rather think I shall have to seek out a copy at some point! Thanks, Karen. The ending is rather dramatic – maybe too much so, but that’s a fairly minor quibble in the scheme of things. It’s definitely worth seeking out a copy. You always know how to make such books sound tempting, Jacqui! And I’ve never read anything else by L.P. Hartley, but can imagine he must be rather good with his observations about class differences. I have an old copy of this somewhere, which I am looking forward to re-reading, I absolutely loved it when I read it about 20 years ago. Oh, I’m really glad to hear that you enjoyed this one as well. You were one of the first readers that came to mind when I was thinking of the target audience for this novel. I think it would definitely stand up to a re-read, especially after a gap of around 20 years. Yes, and I want to re-read The Go-between too, I remember that one less well. Good plan. That’s such a brilliant book – it made my ‘best of’ list last year. The cover reminds me of Tintin. It’s interesting looking at the books of authors who are mostly known for one work. I have looked at some of Hartley’s books but could never decide on any one in particular. I like the sound of this one. Yes, it is interesting to read some of these lesser-known works by writers who have found fame through one book in particular. (Muriel Spark springs to mind here too.) On the strength of this, I’d say that Hartley was more than just a one-hit wonder. It sounds like the author picked a very apt name for his main character! :) Of course now I need to know how it ends, especially after you mention In a Lonely Place in the comment above. Oh dear…I have left you hanging in suspense about the outcome of this one! It is quite powerful, I’ll say that much. This sounds so good. Both the plots and the characters sound so well crafted. I seem to read a lot of books that involve class barriers. However I think that most of them are set in an earlier period that this book is set. Outstanding review as always Jacqui. Your commentary on books is some of the best that I read on the web. You describe a book so well. I feel that I reach a high level of understanding after reading your reviews. Your commentary is a joy to tread. That’s really kind of you to say so, Brian! Thank you – I do appreciate it. Both the plot and the characterisation work very effectively here. I can think of a few books where one element overpowers the other, but thankfully that’s not the case in this instance – Hartley seems to be adept at balancing the two elements. In some ways, the story feels as though it could have been set a little earlier, maybe in the Edwardian era when class barriers were equally (if not more) apparent. It has that feel – like The Go-Between, the majority of which takes place at the turn of the century. It’s been a long time since I read The Go-Between. Hartley has fallen out of fashion like so many others. Yes, it’s funny how these writers can slip into obscurity as times and tastes change. Maybe some readers find these stories of divisions between the social classes somewhat dated now? But then again, other writers like Edith Wharton have stood the test of time, so perhaps there are other elements at play too. Either way, I am glad to have discovered this writer – he feels more than just a one-book wonder to me. As I was reading your introduction and how Leadbitter became a chauffeur, I couldn’t help thinking of his modern counterparts, the Uber driver. Sometimes it seems we’re going backwards. I like the sound of it too but I’d rather read The Go-Between first. Yes we have the same problems with Uber drivers’ status, probably even worse than in the UK where employement laws are a lot more flexible. From what I heard, same problem in Belgium & Portugal. I’m curious to see what kind of fictional life he invented for himself. Ah, yes – that’s the other option. Sometimes it’s difficult to decide which way to go! Many thanks for the re-blog, much appreciated as ever. All the way through I kept thinking – this must be a film – and of course it is! I do like reading the lesser known novels of writers who only have one or two famous books – they may not be as good but they’re often more fun. It is indeed – and, unusually for me, I haven’t seen it yet! Sarah Miles plays the role of Lady Franklin, so it should be good. Yes, it can be interesting to read these lesser-known books, especially as they come without the weight of expectation that often accompanies a writer’s ‘headline’ work. Even though The Hireling doesn’t quite hit the heights of The Go-Between, it’s still a very good book. A most enjoyable read. I loved The Go-Between and The Shrimp and the Anemone when I read them many, many years ago, but somehow never went on to seek out any of his other books. Your excellent review makes this one sound very tempting, even if it doesn’t quite reach the heights of The Go-Between. Lovely review, Jacqui. This sounds like a complex and emotionally fraught novel. I’ve never read Hartley, I saw a dramatization of The Go-Between a while ago and wasn’t hugely impressed, but often with a slower, more emotionally driven story the book is simply more powerful. I look forward to hearing your impressions of the adaptation of this book once you’ve seen it. In a sense could we view Leadbitter as another go-between – a bridge between Lady Franklin’s old life and the new one she wants to create? That’s a very interesting interpretation! He certainly helps Lady F to overcome those feelings of guilt over her husband’s death. I couldn’t help but feel for Leadbitter at various points in the story, particularly in the closing stages.